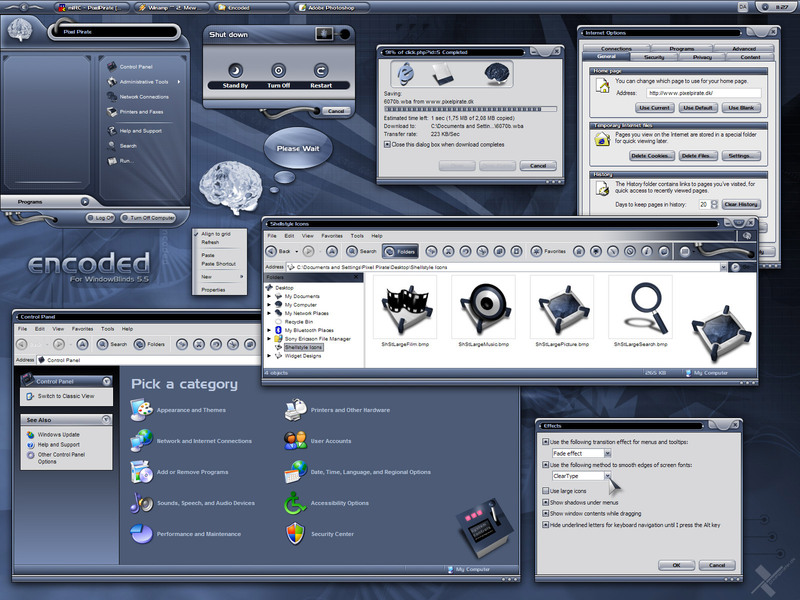 Updated to WB5 with per pixel window frames and shutdown dialog goodies. The old skin is still there as a substyle. Minor update: Fixed font color in control panel add/remove programs. This was started back in the WB 4.3 days I think. It was the 4th WB skin I begun, but as some of you may know, I've made several after that. This one's been with me a long time, and now it's finally done. I've remade the skin 3 times because it wasn't living up to my expectations. Without a doubt this one's been in the works for about a year. The original idea was to have an organic/mechanic WB skin. So it got some of that in the form of wires and a brain. It's got animated push buttons, animated start button (yes - they bounce up and down) and animated start menu. Of course animated Throbber, toolbar icons, progress animations, custom UIfiles to change the text and colors of the special task pane and control panel, right-click roll-up. The three tiny buttons on the lower right are start screensaver, make window transparent and send to tray. The wallpaper is included in the skin file and comes in 1600x1200 and 1280x1024 resolutions. Because of the animations and the included wallpapers, the file is a bit large. One of the best uses of animation that you will find. Innovative but still highly functional. I was lucky enough to test this skin for Lasse and I had a lot of fun! What are you waiting for? Download and share the joy! WOW, WOW, WOW is all I can say. ABSOLUTELY INCREDIBLE!!!! Great job. Just utterly amazing! fantastic graphics and functional for every day use - you best yet!!! I remembered this from some of your teasers many months ago...nice to see it come to life...one of the best suites in the last year...easily. Whoa... there's a link to more stuff? The time and care you put into this WB shows through in the rich detail-- It's everywhere & shows up on so many levels- visual, audio... & the animation-- the context menus are soooo smooooth. Nice one PixelPirate!! This skin is in use here now! Nice animations, I really like the overall design as well! Was worth the wait. A great blind. Great but is there anyway to stop the screen from bouncing in firefox its kwite annoying and stupid. Absolutely beautiful, may even replace Cyrix as my favorite WB skin. Great work! Incredible! All of it! This is ART! Had this been a "premium" suite, I'd have gladly paid. Thank You for ALL of your hard work, and for sharing it! For U.SA. afb - I have the problem with the window contents bouncing in Firefox after changing to any skin if Firefox is open during the change. Closing and restarting Firefox usually fixes the problem. PP - any chance for a Windowblinds?